While desktop trackballs may seem old school, they’re still quite popular—a number of Macworld editors currently use Kensington’s Expert Mouse as their regular input device. The stationary nature of a desktop trackball lets you navigate even the largest displays without the need for a large mousing area on your desk, and models that use a large ball offer ergonomic benefits by letting you move your computer’s cursor with larger arm motions rather than the fine wrist and finger movements that can lead to strain and pain. Kensington’s latest model is the SlimBlade Trackball, and while it may appear to be an updated version of the venerable Turbo Mouse ( ) and Expert Mouse models, it differs from them in a number of significant ways. Like most previous Kensington trackballs, the SlimBlade features a relatively heavy billiard-size ball surrounded by four large buttons, and connects to your Mac via an integrated USB cable. The new model has a lower profile than its predecessors, as well as a more modern glossy-gunmetal finish—deep, metallic red for the ball itself. But the SlimBlade is not an update to those models. Rather, it’s a completely new product aimed less at power users and more towards the typical consumer—someone who spends a good deal of time listening to music and working with images and documents. Kensington will continue to sell the Expert Mouse. The continued existence of the Expert Mouse is a good thing, because many Expert Mouse users will be disappointed with the SlimBlade Trackball, while some people who wouldn’t seriously consider the Expert Mouse may find the SlimBlade appealing. For one thing, while the Expert Mouse takes advantage of Kensington’s MouseWorks software to let you extensively customize the device’s four buttons, the SlimBlade offers no such modifications—the four buttons have set functions, enabled via a software driver. 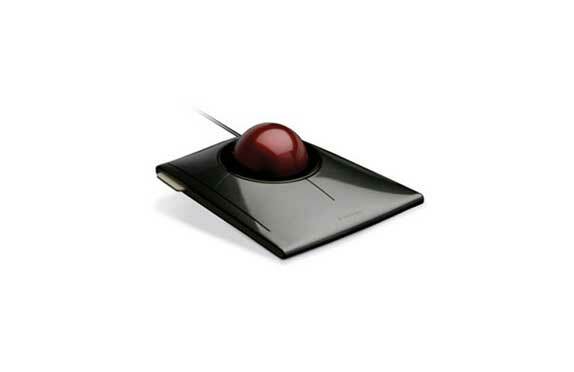 In addition, whereas the Expert Mouse includes a useful, if imprecise, scroll ring around the ball, the SlimBlade uses the trackball itself for scrolling: rotating the ball clockwise scrolls down the page; rotating the ball counter-clockwise scrolls up. While this feature works as advertised, rotating the SlimBlade’s ball without changing your hand position takes practice. Even then, it’s easy to accidentally move the cursor instead of the document. The more reliable approach is to grab the trackball like a dial and “turn” it. The need to change your hand position makes the SlimBlade’s scrolling feature less convenient than the Expert Mouse’s scroll ring or a traditional mouse scroll wheel. I also found that the SlimBlade’s trackball doesn’t spin as freely as previous Kensington trackballs, and that you don’t get the same kind of freewheel momentum when giving the ball a big spin—useful for quickly moving the cursor across large displays. Using the Tracking Speed setting in OS X’s Mouse preferences—the SlimBlade Trackball has no settings of its own—didn’t improve this aspect of performance. The most appealing features of the SlimBlade Trackball are its alternate modes. Although you can’t customize the functions of each button—apart from using OS X’s Mouse preferences to choose which of the two lower buttons is a primary click and which is a right-click—the trackball’s two upper buttons let you switch between three different modes: Cursor, View, and Media. The device’s default mode is, of course, Cursor. In this mode, the trackball controls the motion of the onscreen cursor, the lower two buttons act as primary and secondary mouse buttons, and rotating the trackball scrolls through your document. Pressing the upper-left button enables Media mode, which currently works only with iTunes. In Media mode, the lower-left and lower-right buttons act as play/pause and stop buttons, respectively; moving the trackball to the left or right skips to the previous or next track, respectively; and rotating the trackball adjusts the system volume up or down. Pressing the upper-right button switches to View mode, which works with a slew of programs, including Acrobat, Photoshop, Preview, Safari, Firefox, Numbers, Pages, Word, and Excel. In View mode, rotating the trackball clockwise zooms in on the current window or document; rotating the ball counter-clockwise zooms out. Moving the trackball up, down, left, or right pans your view across the document without you having to press any mouse buttons or use the scroll feature. Pressing the lower-right button zooms the document to fit the current window size, and pressing the lower-left button restores the view to 100 percent magnification. When you’re done using Media or View mode, pressing its button again returns you to Cursor mode. As you’re using the Media- and View-mode features, onscreen graphics confirm each mode change or action. Unlike the standard scrolling feature, I found the SlimBlade Trackball’s View and Media features to be both useful and intuitive. However, not all features are supported in all programs; for example, the fit-to-window button doesn’t work in Preview. As a cursor-controlling device, the SlimBlade Trackball’s scrolling mechanism is a bit of a step backwards from Kensington’s previous trackball model, and the lack of customizable buttons will turn off many veteran trackball users. On the other hand, the SlimBlade’s clever Media and View modes take advantage of the unique attributes of a large trackball to make it easy and intuitive to work with many documents and media. If you spend a good deal of time working with those types of files, the SlimBlade Trackball is worth considering.